It looked like we had a couple days of good weather ahead and we planned to take full advantage. Although I had no real reason to, given the late sunrise, I was still getting up early, brewing some coffee in the lobby, backing up my remaining SD card, and loading images into my traveling Lightroom catalog. I have a small, portable harddrive tied to my Surface tablet, and I am also keeping all the images on the SD card, at least until it’s full. If I keep this up, I’m not terribly concerned about losing the extra cards—they were empty. Hali is one of a cluster of simple, nice guesthouses that sit as satellite buildings surrounding a a common dining hall, check-in, and museum; all within a working ranch above the coastline. Our building has a common area with a few amenities, coffee, tea, and plenty of nightly beer. It is here that we gather morning and evening to share processing tips, strategize for the coming days, and basically get to know each other. The group has bonded nicely, and it’s good to have a few nights in one place. We drive up to breakfast and as we exit the van, Thor tells me a stranger left him a voicemail last night. 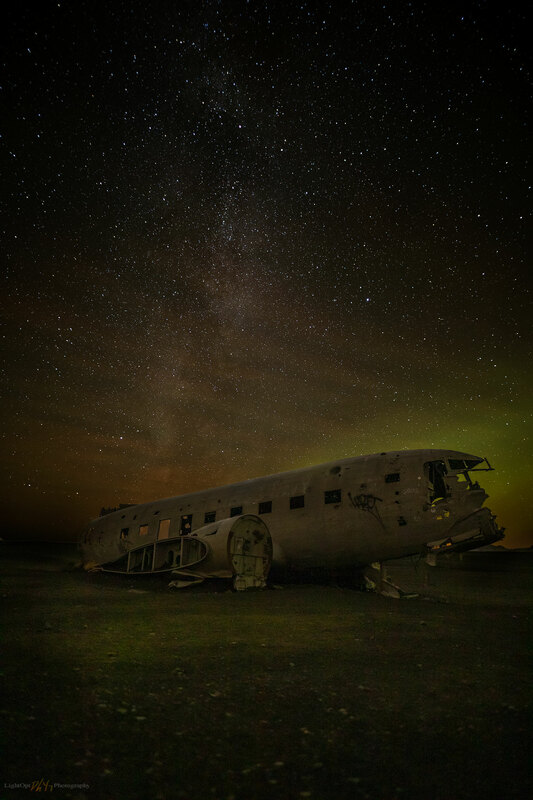 He says that an American couple he talked with during our shoot at the Solheimasandur plane wreck had stumbled on my battery bag, remembered Thor Photography, and deduced that some silly person in Thor’s group must have left it behind. And, it turns out, they are basically paralleling our travel route and figure we can easily cross paths in the coming days. 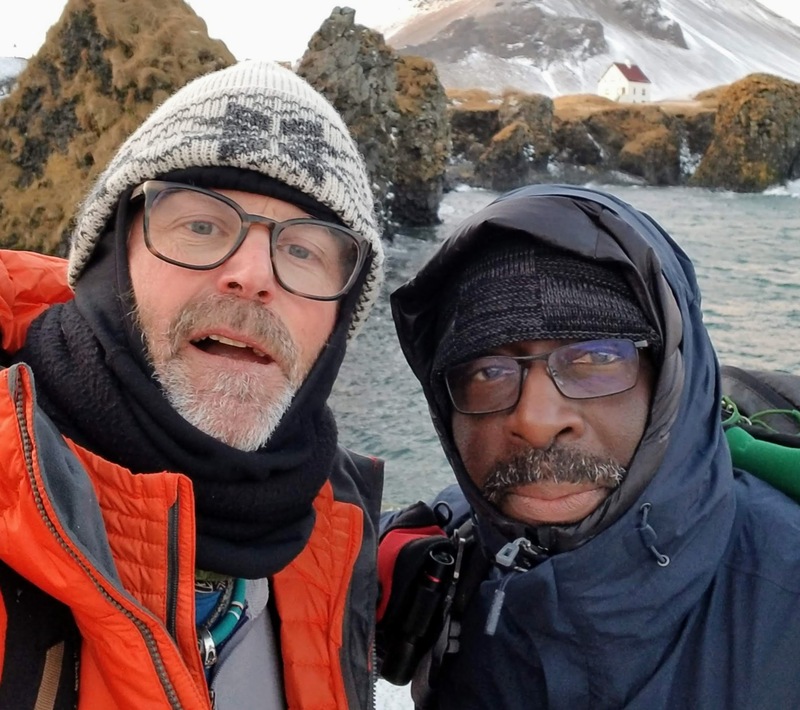 You might think this would call for the cliché of “only in Iceland”, but I’ve experienced random, yet purposeful, acts of kindness—often revolving around my losing bits of gear—from the islands of Fiji to the jungles of central Africa. People are good. Cool light of early morning, and first shots at Diamond Beach. Diamond Delivered. I’m reminded of Racetrack Playa in Death Valley National Park, US. Today we focused on Diamond Beach at the outlet of Jökulsárlón. The dawn was cloudy, cool blue and grey, but breaks in the clouds teased of goodness to come. We huddled at the van with Nick and Thor for some general tips for shooting on the beach; I think these guys knew the group would soon be scattered along the beach like children at an egg-hunt. The black beach with its lag of glacial chunks and shards is one of the icons of the South Coast. I had of course seen several videos and many images documenting the multi-faceted, crystalline remnants of wave-polished ice, in sizes from bergs to tumbler cubes. Yet, it is difficult to grasp the scale and simple beauty of the setting until you begin to wander among the diamonds. 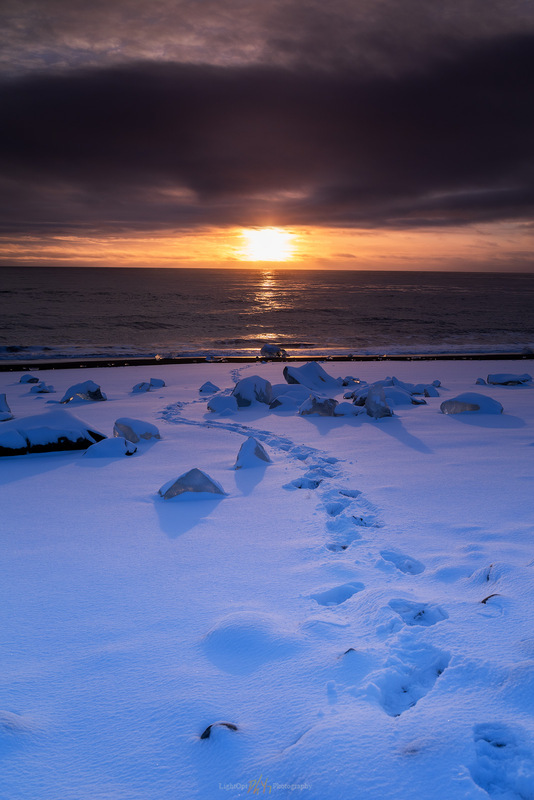 A fresh coat of snow added contrast and drama to the black shoreline and its scattered crystals. We readily and greedily dispersed. 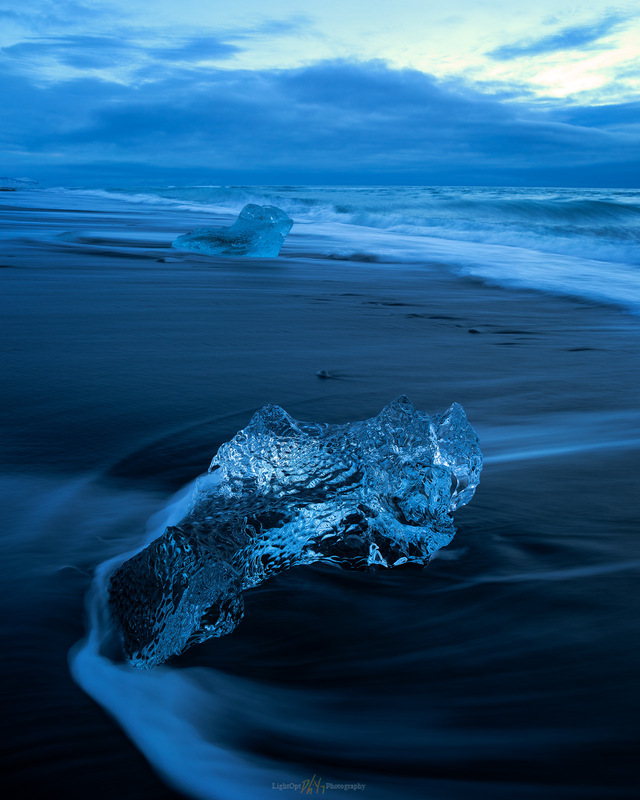 The ebbing tide and a debouching stream pull glacial bergs from Jökulsárlón, and the slowly melting ice rolls into long-shore currents to be distributed by curling waves along the black beach. 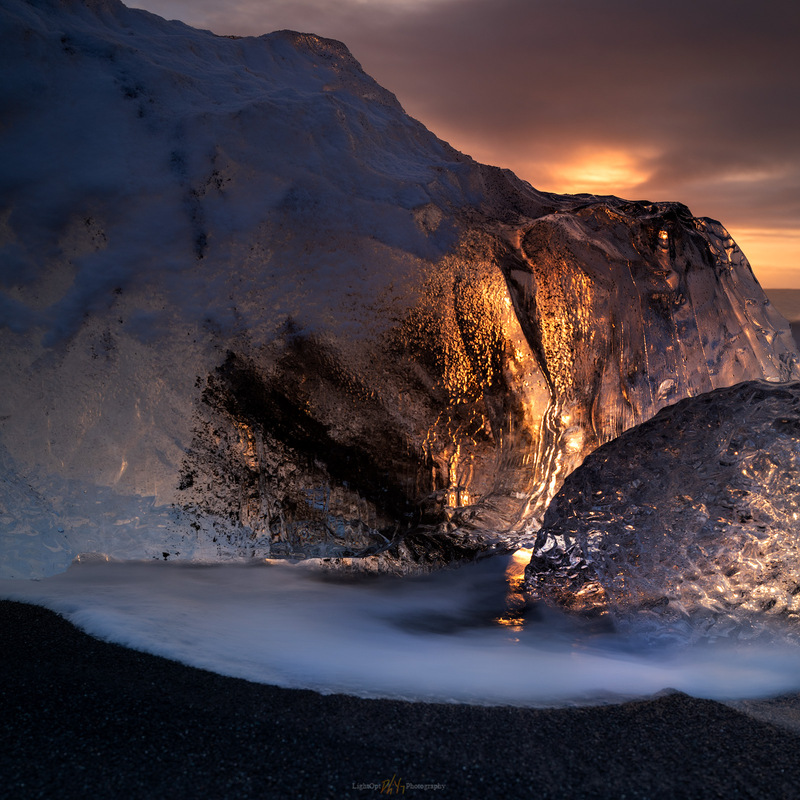 Gathering and focusing the ambient light, the little bergs of ice glow against the darkness of volcanic sand. As usual, arriving before dawn, we had the beach to ourselves; remember, in the Instagram era iconic is synonymous with crowded—we were ahead of (or behind) most of the crowd, yet again. We also had the good fortune of fantastic conditions. The fickleness of storms and currents can either pack the shore with ice, creating a mish-mash of shapes and clutter, or strip it bare, leaving a simple, curving and empty beachline. It was practically Goldilocks day, just right—actually, just perfect. Traces and swirls as dawn arrives. 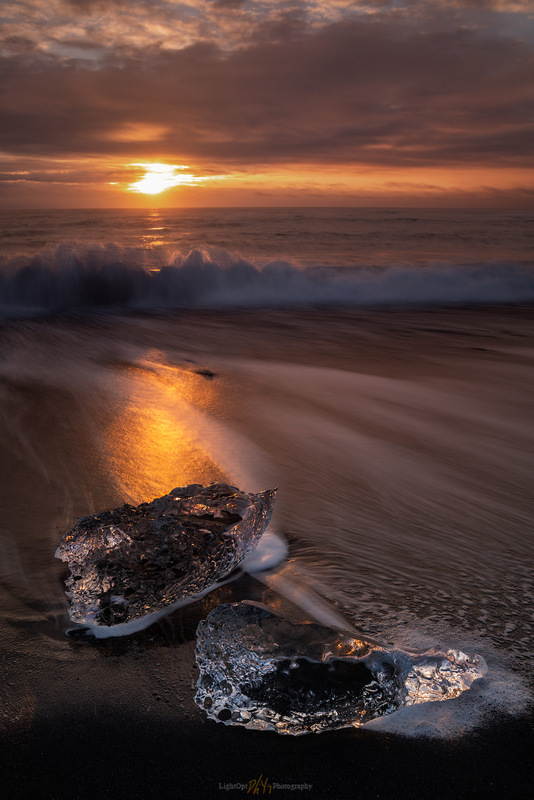 Although it is an iconic shooting location, it’s first and foremost a seascape with ice. This means, unlike many icons, it’s dynamic and every shot is different. 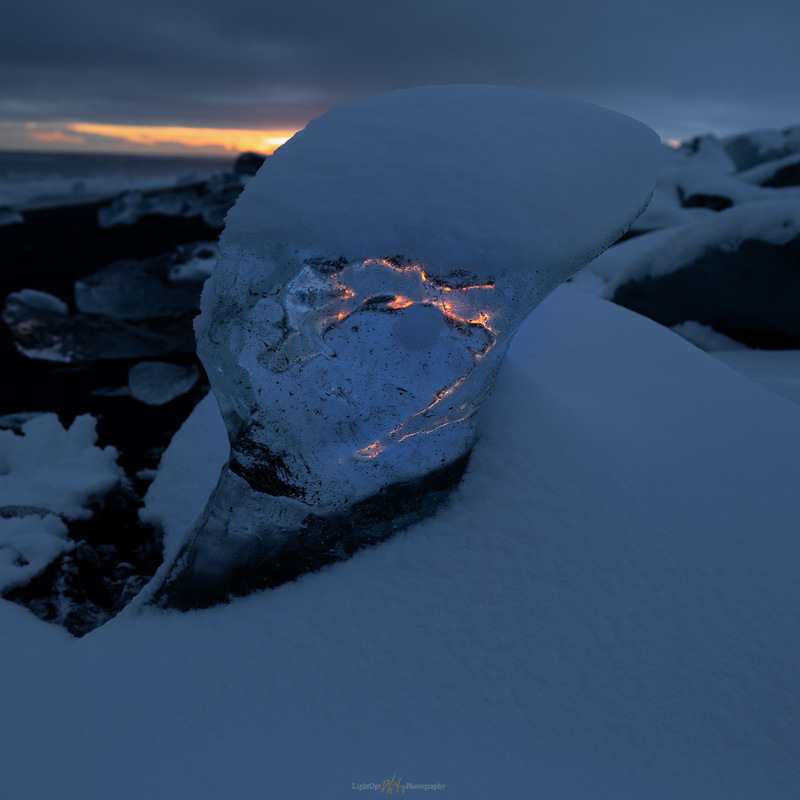 However, there are basically three common compositions: 1) splashy waves surrounding and retreating around emerging bergs; 2) dramatic otherworldly crystals lit by the winter sun; and 3) intimate images of a lonely diamond on black sand. Or some slight variation on these. Several us dispersed far up the beach as the crowd grew near the easy walk-in spots. 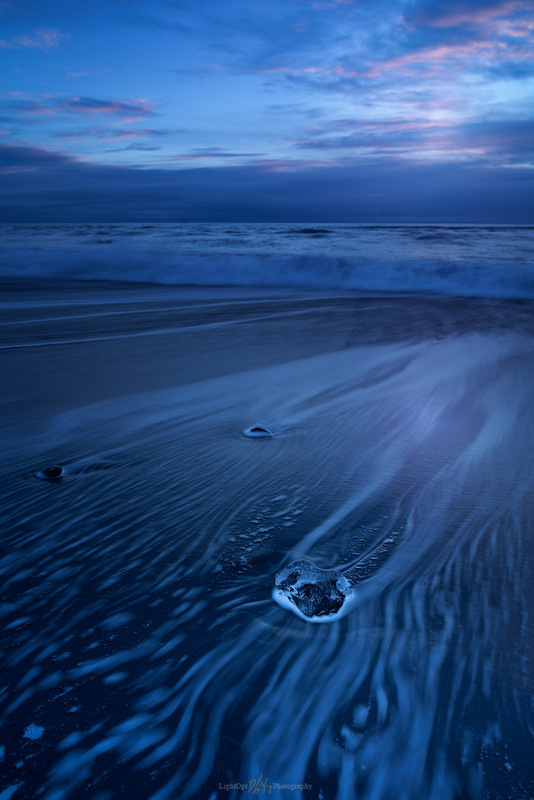 I shot in burst mode, capturing the interaction between various shapes of ice and incoming and outgoing waves. Even with intimate scenes of a single crystal, its interaction with a framing, foamy surf can make or break a potential keeper image. Getting up close, down low, and purposefully identifying the subject improve any of the three basic compositions significantly. Of course, these means getting familiar with the surf, occasionally getting into it, or even getting surprisingly soaked by it. We came prepared to get wet, and it was great fun. The Wave Escape. In close with a small berg. Classic Diamonds. Watching this unfold in-camera and in processing simply stunned me. We took a break for lunch. Or we didn’t. Maybe. The conditions were so good we may have simply kept going. The day was so good I honestly can’t recall what we did, if it was something other than finding new compositions and taking advantage. I do know we eventually moved inland to the lagoon—basically across the highway, where we watched a practically endless, golden-hour sunset emerge from a cloudless sliver on the horizon. Um, Goldilocks had grown up and was now lording over us—it’s not just-right, it’s wonderland (or is that Alice?). Being daytime, it was the opposite of our aurora show, but I was as gobsmacked today as I was on any previous night. Standing Above. 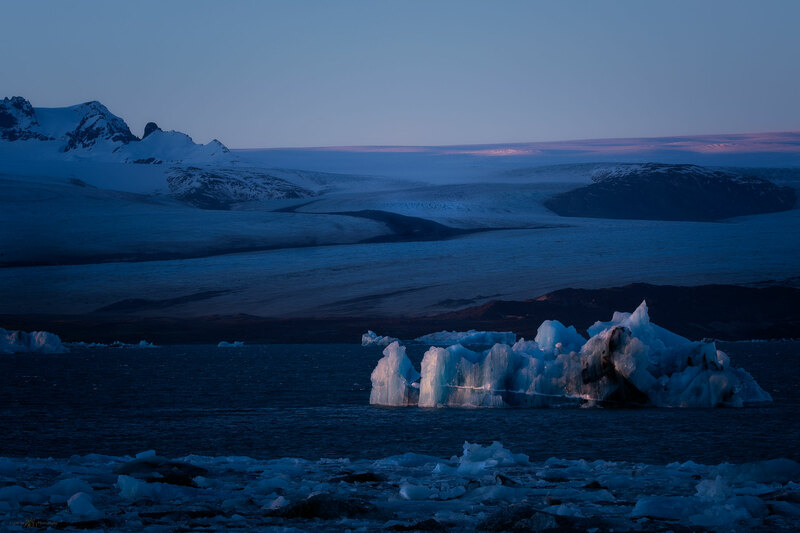 The light continued into the afternoon, rising over Jökulsárlón. Mist and Massif. 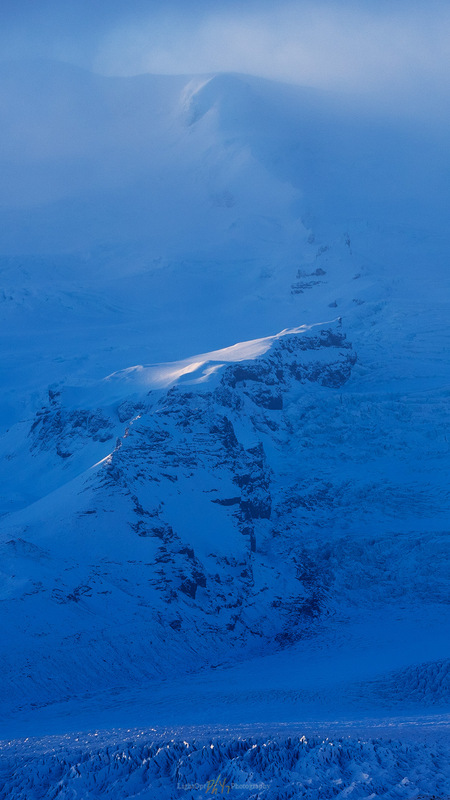 The power of the glacier-covered mountain drew my attention from even the best-cut diamond. 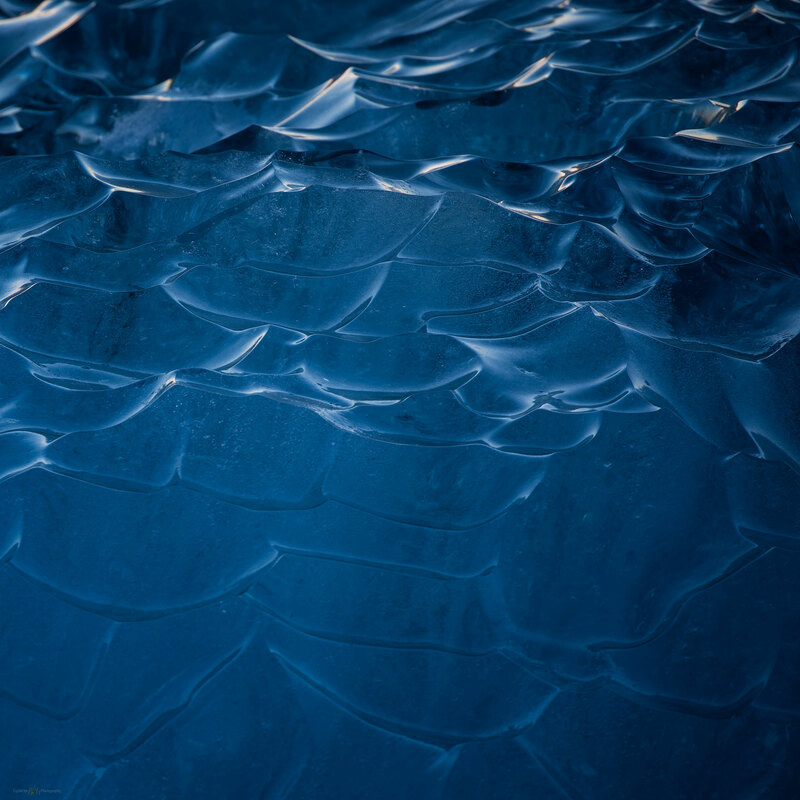 All afternoon I’m overwhelmed with mountain scenes rising from Jökulsárlón—I could photograph mountains forever. But soon, I catch Nick motioning to those of us near him, he’s heading back to the beach as the sun settles into the ocean. We had spent the morning capturing the iconic compositions, getting practiced and occasionally successful at the three basics, but his instinct drove him to look for something different, something other than the popular shot. 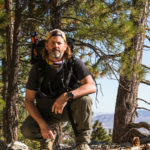 Generously, he shared a glimpse of that instinct and encouraged several of us, those of us within earshot and anyone he came across, to think about how the last light would interact with some of the snow-covered bergs higher on the beach. Maybe, by considering this, we’d get something unique to add to our successful morning. It is a common instructional tool, “look for something different”, but this was in real-time, with perfect conditions that where somehow improving, if only in the last breath of light. Leaving Light. Finding fresh snow at day’s end amazed me. Fire Within. Seeing and feeling the difference. Did I translate his wisdom successfully? I think so. Is it truly unique? That’s unlikely. 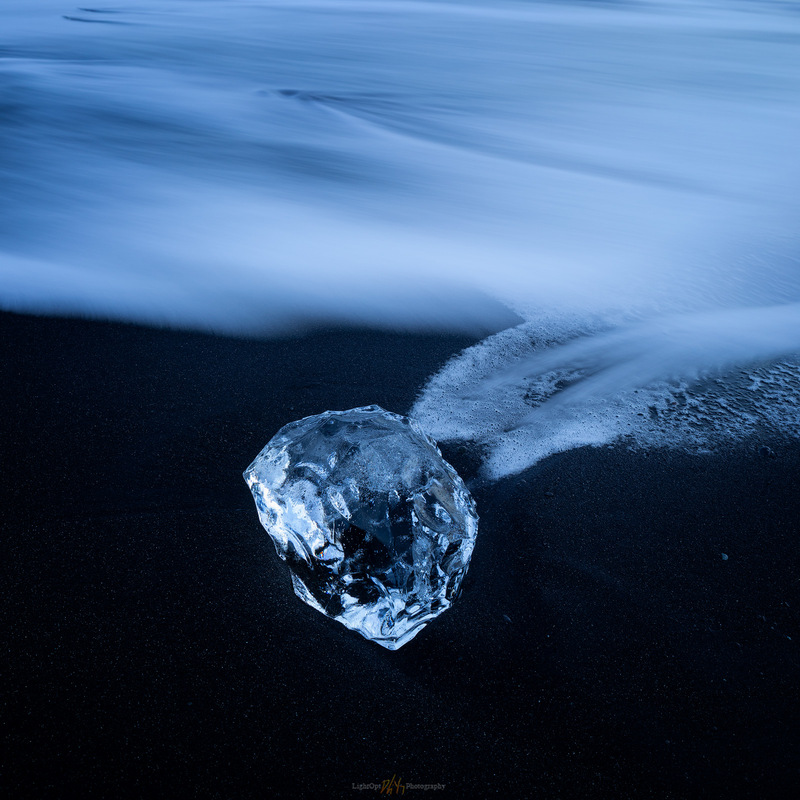 However, it’s definitely not the million-in-a-million images of the ice at Diamond Beach (as enjoyable and compelling as those are individually). Maybe it’s unique in a hundred-in-a-million sense. Regardless, it was about knowing (or learning) to see something new, even if you’ve only been in the perfection of the icons and diamonds for a day. Thanks Nick. It had been a successful and demanding first day of shooting. With the curtain lifted, we had taken full advantage, leaning into the wind and reaping rewards. Upon returning to the guesthouse, we did not have time to relax, as the Kp-index for the evening rekindled excitement. I downloaded and backed-up my day’s images and joined the growing table for dinner. All chatter focused on the wind and atmosphere created around our recent locations, but soon our talk shifted to aurora. 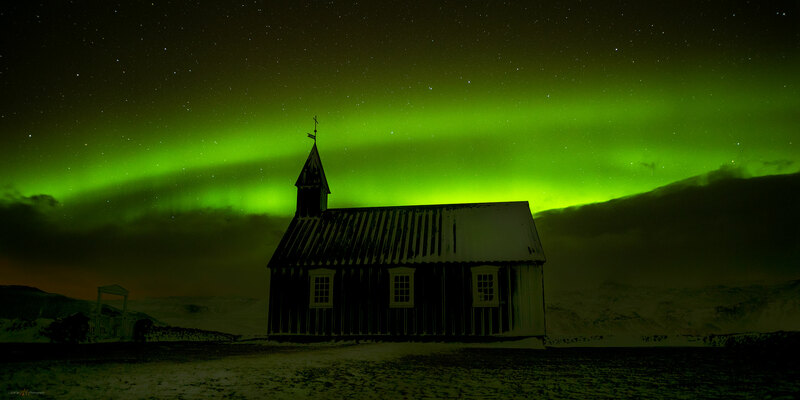 Icelandic photo tours and workshops promise* aurora. There is always an asterisk, only Nick and Thor deliver aurora (read-on). The Kp-index is an index of global geomagnetic activity derived from measurements from ground-based magnetometers at high, northern and southern latitudes. Based on real-time measurements, the NOAA Space Weather Prediction Center provides a Kp-index forecast helpful in protecting sensitive technology. This is important stuff. 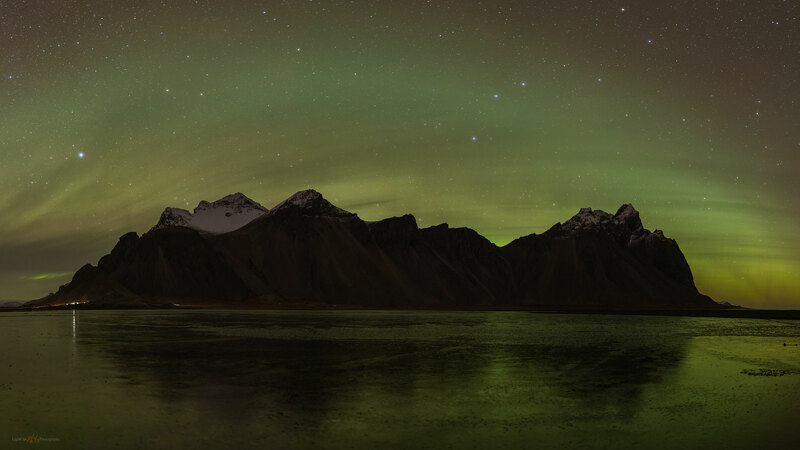 But, even better for photographers, the Kp-index is also a predictor of aurora. Several of us had mobile apps loaded for alarm notifications of indices, say, greater than 4.0. The scale is 0.0 to 9.0. 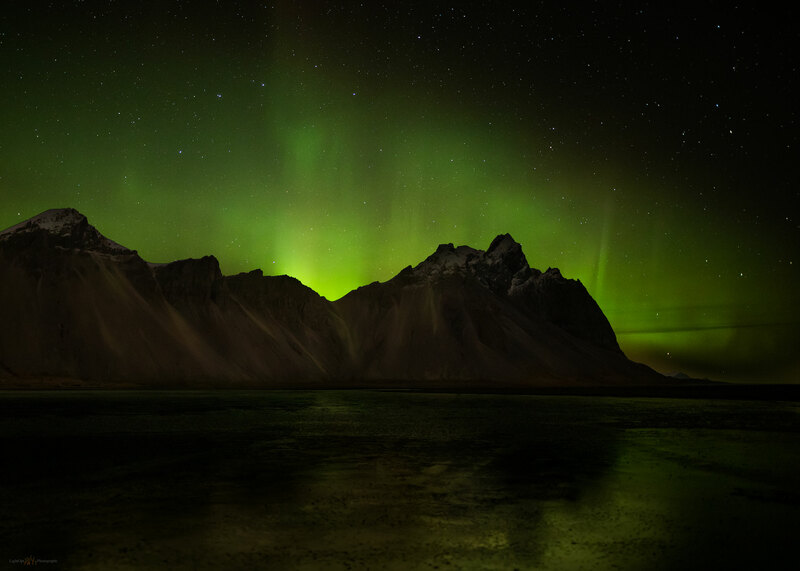 I’d need an index greater than 7.0 or 8.0 to have any chance of seeing aurora in Nevada (it happened once), but when it’s 4.0 in Iceland, you get ready for some night photography. Nick, walking the hallway between after-dinner recons on the snow-buried porch, said to the be at the van at 9 PM. Then he said, “8:30”. Then, “8:00… Um, no, let’s just go now!”, a green glow leaking beyond a low, receding band of clouds in the northern sky above the guesthouse. With or without the predicted index, aurora activity remains elusive. The sky can light up at any moment and with the storms of the past few days, we knew the clouds could mask everything without any warning. A few team-members had decided by dinnertime that the day had been plenty fun. The wind and blowing snow can drain motivation—the wind had yet to let up and we were headed back into the gale, and jet-lag may still been wearing on those that just arrived. Six of us climbed back into the van, ready for a long, cold night. We returned to Búðakirkja. The northern lights need a foreground, awesome colors dancing over a dark, featureless horizon is awesome, once or twice, but the images really work best when they accent a subject. Of course, I was still in the “once or twice” stage and hoping for awesomeness. I didn’t care if there was a church, a cathedral, or a unicorn in the foreground, I just wanted to experience the lights. I’d seen a white veil of aurora as a kid on a canoe trip in Minnesota and again as an enigmatic red blob over our house in Reno. 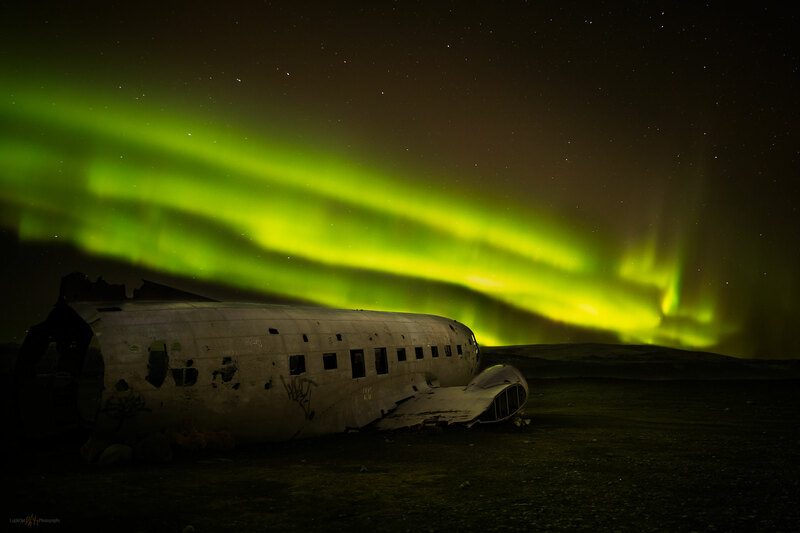 I’d seen some nice waves of aurora on the plane, booking a port-side window with that hope in mind—so the precedent was set. According to plan and hope, we were the only ones at the church (others soon arrived). We talked a little bit about ISO settings and cautions of exposure times that could be too long. You can blow out highlights and green blobs can overwhelm the interesting waves. We stepped back into the wind, oh, the wind, and then stumbled to get a composition. I only stumbled because I was dumbstruck by the shaft of green light leaping from the horizon. This is what I was here for. My fingers seemed to freeze in minutes, I didn’t care, and we kept shooting for a couple hours. I could hear myself laughing at the images on the back of my camera. I could hear coincident laughter and cheers coming from those next to me and from beyond the little cemetery in the churchyard—or was it the subterranean residents commenting on their nightly view. Only Thor said, “I’ll give it 2 out of 10. Maybe it’ll be better tomorrow.” Sometimes I just watched, this was perfect. 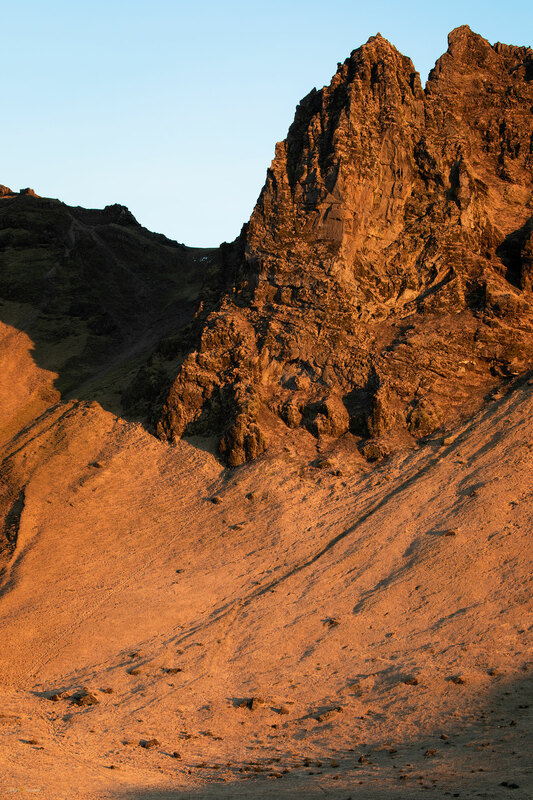 The Last Pillars of Búðakirkja. I can’t say I nailed the images. I barely have experience getting daylit landscape images to cooperate; this is completely different, but so much fun. Buffeted by the wind, Nick crouched with me for a while and we talked about learning from our previews and setting the camera to provide good feedback. There are a few keepers in my collection, and they’ll forever be memories of this first night. 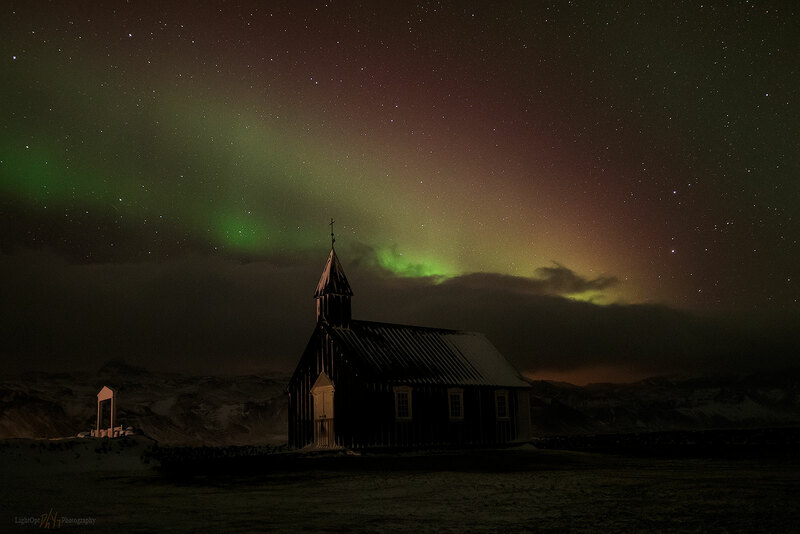 As I saw in the morning, the darkness of the black church adds weight and mood to the spectral sky. My first attempts with the multi-colored waves, pillars, and streaks building above the church and the distant mountain range was worth the entire trip. How can Thor say this is a 2 out of 10? For me, this was 11. Spoiler, tomorrow I re-calibrate my scale. Although the Kp-index remained promising, the aurora faded. And the long day was taking its toll, our group dimmed with the lights. Time to pack it in. We pondered not sharing our images with the portion of the group that hadn’t joined us, downplaying our gobsmacked adventure. But that wasn’t at all possible. The morning’s breakfast table was alight with the tales and contagious excitement of the previous evening. From now on, it was all in—none of us would make that mistake again. The van was stuck. We walked from the hotel in the blue light of pre-dawn mid-morning to find Thor shoveling and sweeping a deep, wind-blown drift from the half-buried van. Even four-wheel drive would not get it out and the wind was howling, the piles getting deeper. In the shadow of the guesthouse the snow was deep, but beyond the building’s wind-shadow, the gust could only blow it to the sea. Away from the van, the parking area was almost bare. Some more shoveling, a quick tug with the smaller rig, and the van was free. It was difficult to recognize individual team-members dressed in their cold-weather gear. Gortex colors became identifiers, and the variety of hats important clues. The temperature wasn’t unbearable, but the wind-chill bit at anything and everything exposed. 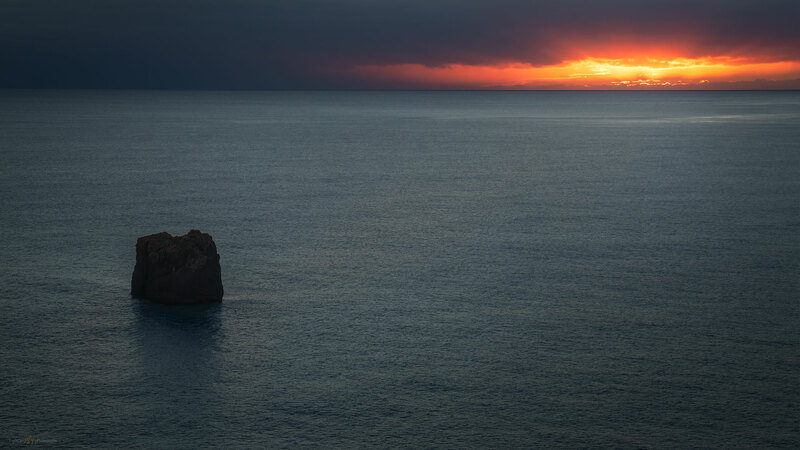 We were headed down the coast, peering into the horizon as the clouds thinned and the dawn teased. By the time we turned into Búðakirkja (black church), the clouds lifted and the sun greeted us—the wind would remain our compulsory companion for the day. We gathered around the back of the van, excited to be at our first location. 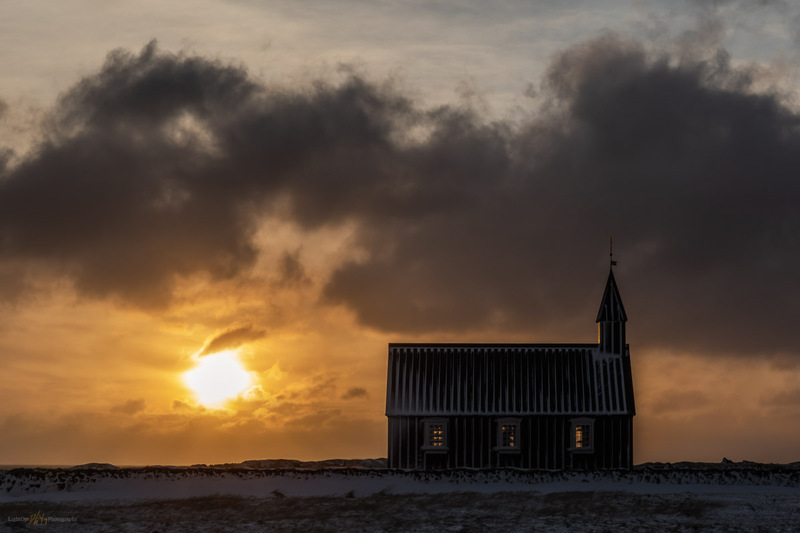 Nick talked about capturing the icon, while also reminding us to consider the variety in the location – from lava flows, to the seascape, giving the dark church building some context. Expose for the sky, consider your foreground. Let the wind add character. 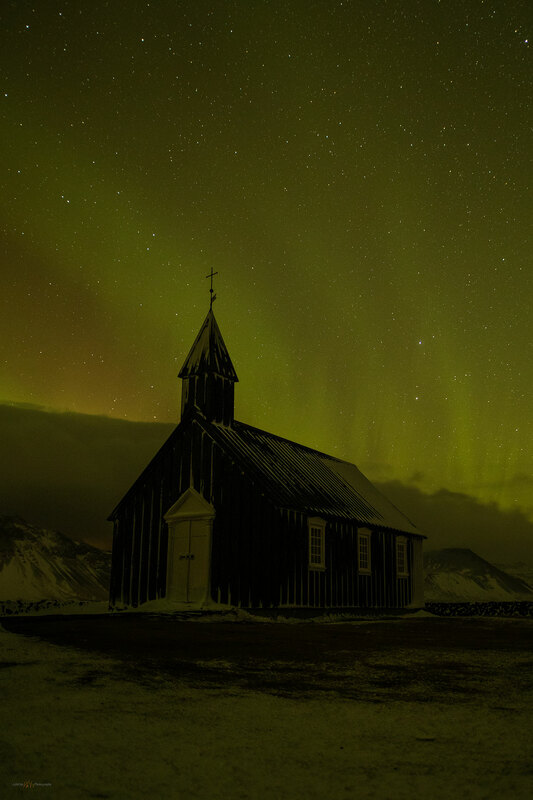 Although the church sits in a picturesque location, its construction of dark wood (shipped in long ago, of course) sets it apart from the typical white and red church buildings that pop up all over Iceland. The group scattered once we adjourned the huddle at the van. Nick and Thor wandered between participants and composed shots from their own perspectives. Almost immediately one could start to sense the personalities of the group. Some sought one-on-one instruction, some gathered in small groups to compare and share, and others wandered independently. On the first days, I was in wandering mode. I wanted to take it all in. The iconic shots are seductive, but I didn’t feel that interested in shooting buildings. I convinced myself of disinterest in the church, but that only lasted until the sunrise started to play on the contrasting dark building. 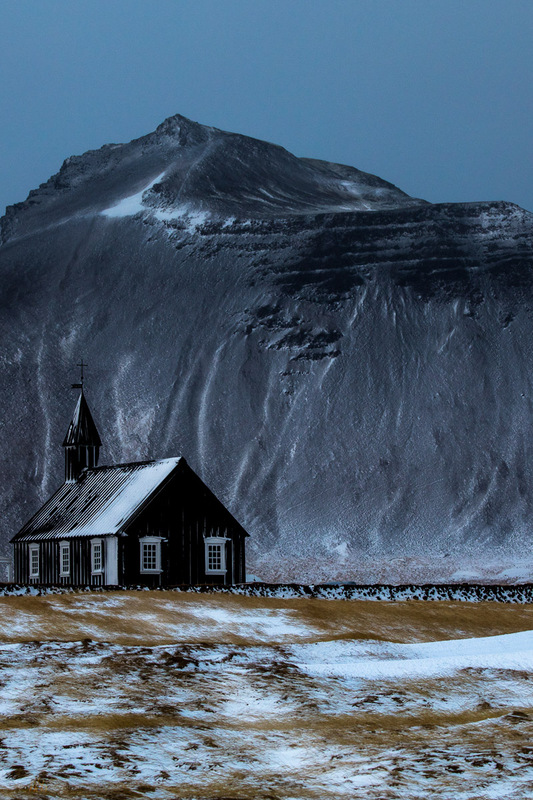 Here’s a regular, common shape—a church any child would draw—rising from treacherous black lava flows and getting bashed by the wind-blown snow. We were soon all lined up to capture the gaussian sunrise as backdrop to the strong little building. After an hour or so, we clambered into the calm warmth of the van to move west to an abandoned building on Dagverðará. 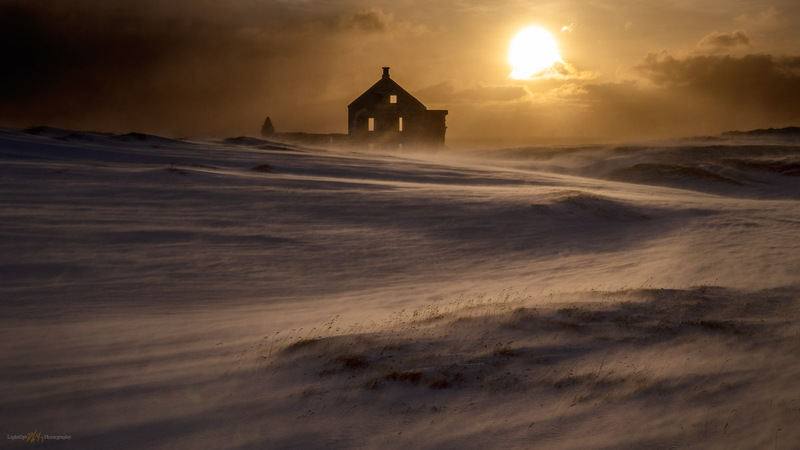 A setting similar to Búðakirkja but with appropriate drama created by the backlit blowing snow and the lonely shape of the worn structure. The wind was deafening and, if anything, increasingly so. We huddled on the banks of a frozen, snow-covered stream and just about everyone composed a similar shot. Once in place, it was almost too much effort to move against the wind for something different, and this just looked so good. 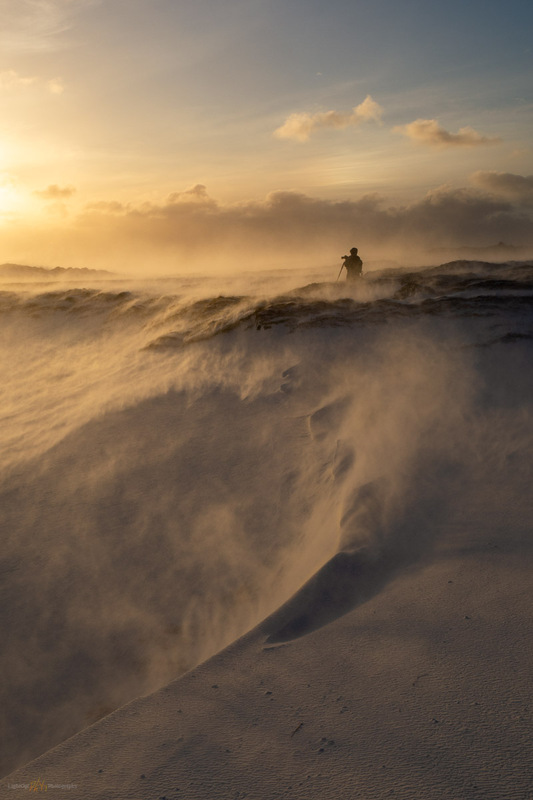 While the composition was static, the lapping clouds and glowing gusts of snow made each exposure different. It was perfect time to plant the tripod deep in the snow, let the wind blow, and watch what happened, capturing shot after shot. A side trip for some lunch and coffee led us to brief stops at Hellnar and Arnarstapi. The skies continued to clear and the new lack of clouds seemed to free up the wind. I’ll stop mentioning the wind when it drops below 50 mph; this won’t come soon. 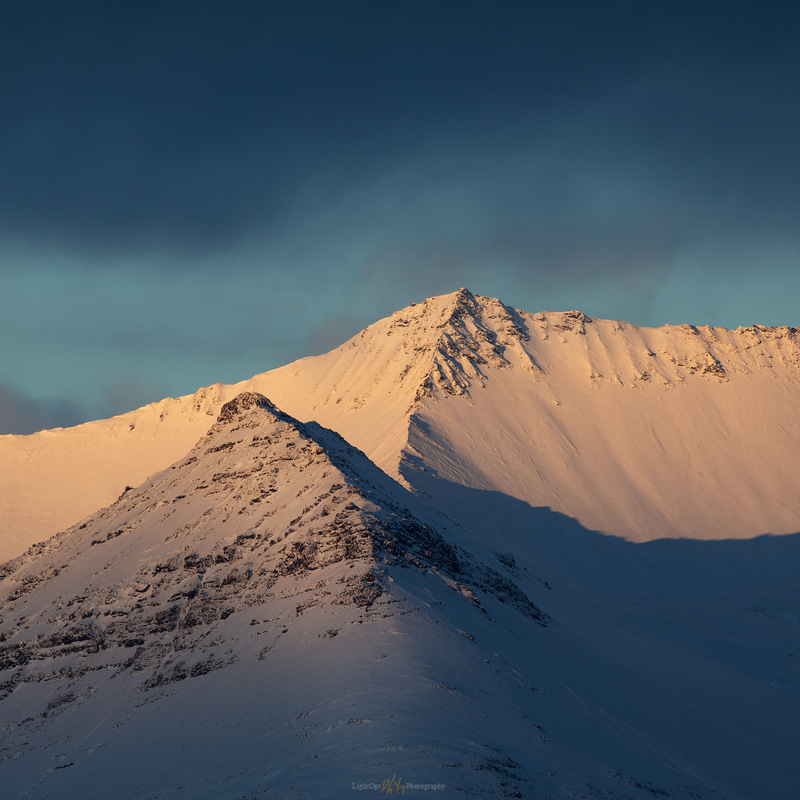 In the Iceland winter, the slow transition from sunrise to sunset happens without an intervening day, allowing us to take our time, watching perfect light dance around us. The mountain-front to our back, including the prominence of Snaefellsjökull remained hidden, while the seascape drew us onward. 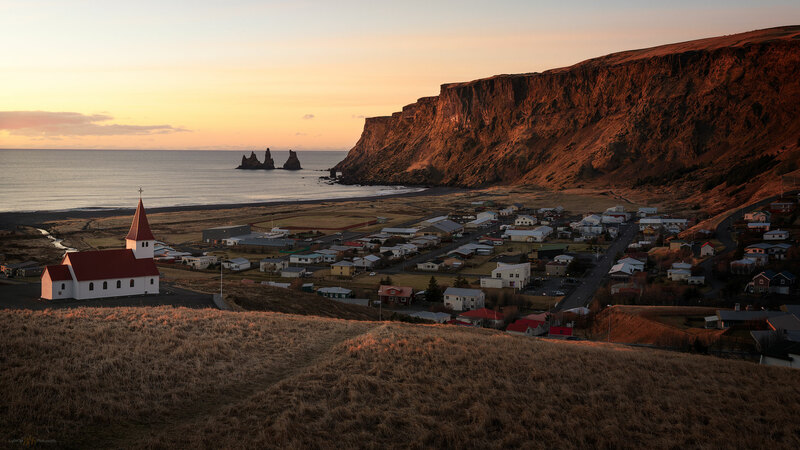 A short hike took us to Lóndrangar where volcanic plugs eroded from surrounding rocks remained perched as seastacks, black pedestals in the stormy seas. We found a precarious perch to watch the sunset and the few remaining sea-side clouds. It was almost impossible to talk to each other now, even though we were huddled together on a steep spit of land and a small viewing platform. A few pieces of equipment, lens caps, remotes, hats, gloves, and the like, threatened to or actually did get lost to the wind and sea. 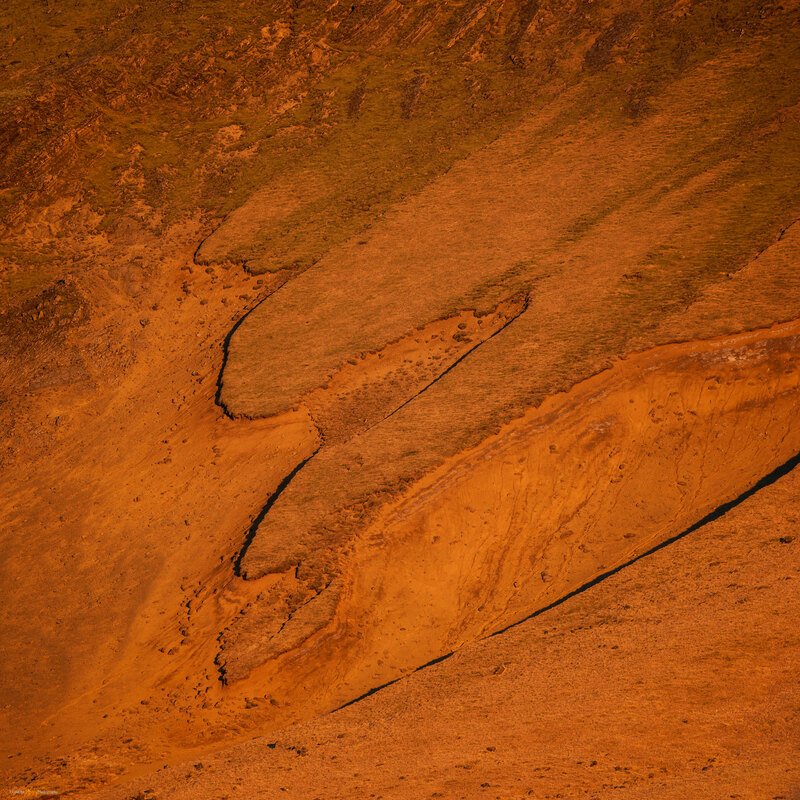 We were, however, awarded with another highlight stop on a singular day on the Snaefellsnes Peninsula. False Land. 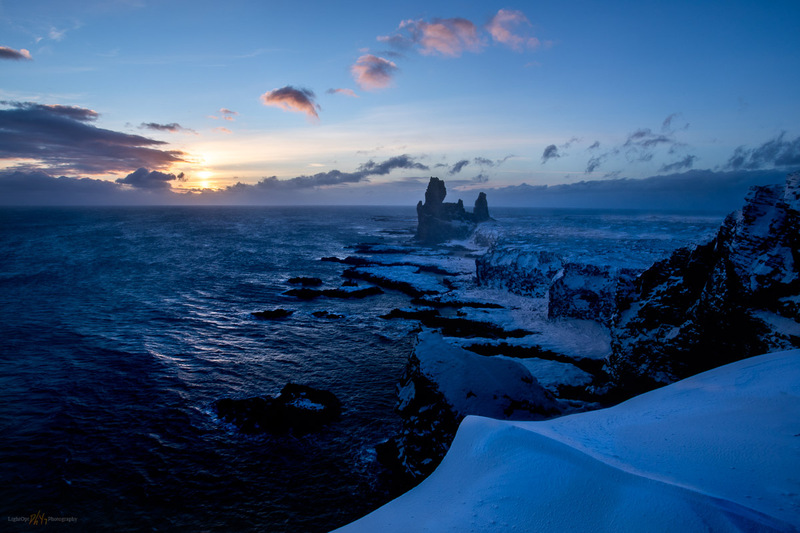 Sunset at Lóndrangar. 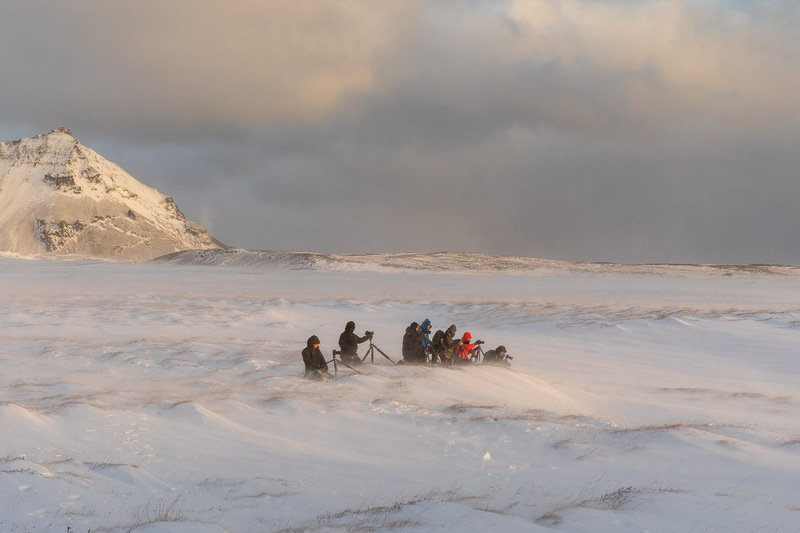 We had only been “on location” with the workshop for six hours and we already had stunning conditions. It took some effort on the part of each participant—the wind can kill patience and composure—but Iceland was serving up her best and it was only the beginning. In fact, the “day” was far from over.